The Côte des Bar is an island between the plains of Champagne and the rolling slopes of Burgundy. To reach it from the Côte des Blancs, one drives about two hours south from Épernay, rolling across plains filled with wheat and green cover crops broken up by intermittent forests. The largest city near the Côte des Bar and that of the Aube département (10) in which it lies is Troyes, once abundant with textile factories but now perhaps most known for its high quality andouillette, a powerfully aromatic sausage made from pig's intestines. Just south of the Côte des Bar, one finds the small village of Chaource, where the creamy, buttery and delicious cow's milk cheese takes its name. Less than an hour southwest lies the northern tip of Burgundy and the town of Chablis, making the Côte des Bar the transition point between Champagne central and Burgundy. The soil in the Côte des Bar is closer to that of Chablis — Kimmeridgian marl topped by Portlandian (Tithonian) limestone — than it is to the vineyards near Épernay and Reins, which is composed mostly by Cretaceous chalk. Unlike in Chablis, however, producers in the Aube specialize in Pinot Noir. Humid Atlantic influences coming from the west and continental influences with higher temperatures are two factors that help Pinot Noir ripen extremely well in the area. In fact, Pinot accounts for almost 90% of vines planted in the region and strongly influences the character of its Champagnes. Nevertheless, the Côte des Bar has diversified terroirs. Specific soil types, local climate conditions, slope and orientation are extremely varied, producing separate micro-climates. Each vigneron needs to be fully attentive to his own terroir in order to make the most of it. The region has had a tumultuous relationship with its northern brethren. After the phylloxera, the 20th century began with conflicts due to the demarcation of the Champagne region. The strong Marnais Winegrowers Union worked to exclude the Aubois vineyards from the natal district. The pretext was that until the French Revolution, the Côte de Bar was part of the province of Burgundy. In addition, bulk wine from the Aube had always been sold cheaper than that of the Marne, and the Marnais were eager to protect their higher pricing. Consequently, an order in early 1909 excluded Aube from the Champagne areas and an act written shortly afterward forbid the Aubois winegrowers from selling their grapes to Champagne houses in the Marne. This law created a local explosion because it shut out the Aubois winegrowers who had just heavily invested in restructuring their vineyards. 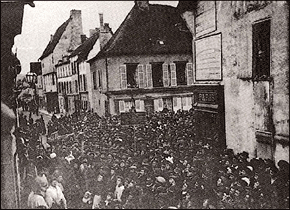 Ensuing tension provoked the famous winegrowers revolt, during which time more than 3,000 soldiers were sent to Bar-sur-Seine in May to calm the fury of the winegrowers and the general population of surrounding villages. 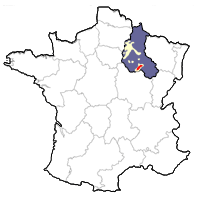 After much negotiation, a sub-zone Champagne region was created in June by the government for producers in the Aube department. Finally, after years of pressure, a law signed in July 1927 reintegrated all the Aubois districts into the Champagne region. The Aubois vineyards were saved for good and today comprise nearly 20% of the plantings in the entire Champagne region. That being said, few prestigious houses are located in the Aube, and the glitz and glam of the big boys is nowhere to be found. Instead one finds a host of small producers whose output varies almost as much as the local landscape.